Visit the panoramic Amalfi Coast and the magnificent Bay of Naples on this self-guided walking holiday. Spend the day walking on the beautiful island of Capri, then hike along the scenic coastal Path of the Gods to Positano. Today you will arrive in Sorrento and check in at the hotel. If you arrive early you may wish to visit the town and the old port at Marina Grande that has several seafront restaurants and a small beach.Alternatively, if time allows, take a walk through the historic and characterful streets of Sorrento. Catching a ferry from Sorrento Port to Capri, your short boat ride affords impressive views of the coast, its clusters of buildings clinging spectacularly to the cliffs. Although only a small island measuring seven kilometres in length and three kilometres in width, Capri's magnificent 600 metre-high cliffs contribute to its imposing appearance. Capri has enjoyed coastal resort status since Roman times, but today's walking gets behind its glitzy façade of trendy boutiques and cool cafes. You have the choice between two walks on the island. The shorter, easier option takes you to Emperor Tiberus' villa - a remarkable testament to 1st century Roman architecture. The second option is a longer walk from the hill town of Annacapri, down to the west coast then along an easy coastal path to the Blue Grotto, with spectacular panoramic views. Capri's excellent network of public buses, along with its cable car, make exploration easy. After your chosen walk, you may like to enjoy the buzz of the main town, before heading back to Sorrento by boat. 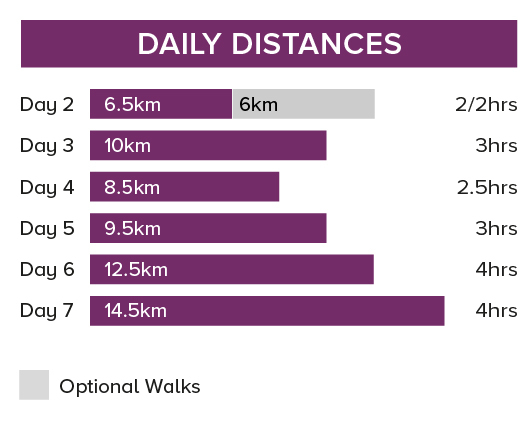 Depending on which walk you choose, you can expect today's five and 12.5 kilometre walks to take approximately one-and-a-half and four hours, respectively. A private taxi transfer of around 30 minutes takes you from Sorrento to Termini from where you walk to Punta Campanelle, the tip of the peninsula that divides the Gulf of Naples from the Gulf of Salerno, and then down to the wonderful beach at Marina del Cantone. The day's itinerary offers spectacular views of the Island of Capri, the Amalfi Coast, the Gulf of Naples and Mount Vesuvius. If you would like a longer walk then you can either start the walk in Sorrento, or ask your driver to drop you in Sant'Agata dei Due Golfi and start the walk from here. You can expect today's 10 kilometre walk to take approximately three hours. The 17.5 kilometre option from Sant' Agata dei Due Golfi will take you around five to six hours. 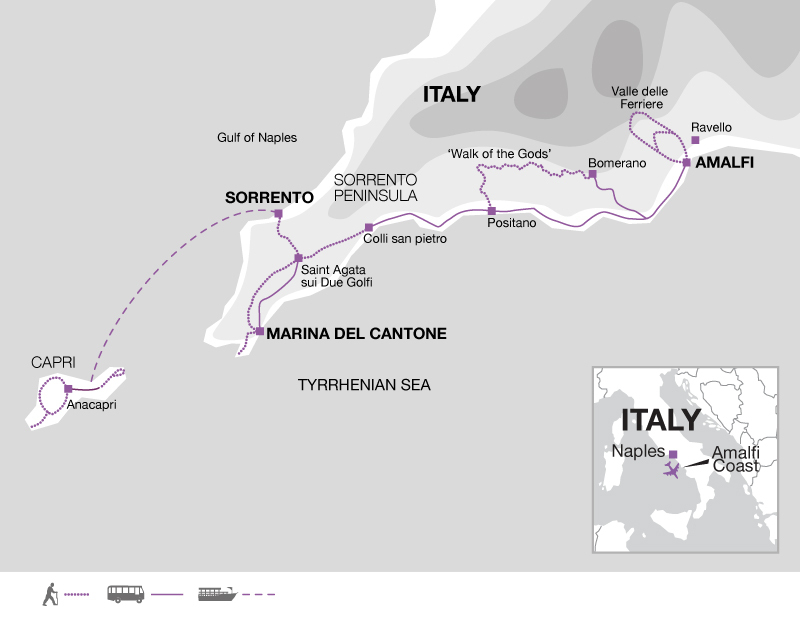 The longer 22 kilometre walk from Sorrento will take around seven to eight hours in total. Today's circular walk takes you to the lovely Bay of Leranto offering great views over to the Island of Capri and of the Amalfi Coast. There is also ample time to go for a dip in the blue Mediterranean Sea at a small secluded cove, or just relax and have a nice lunch in Marina del Cantone. You can expect today's eight-and-a-half kilometre walks to take approximately two-and-a-half hours. A short private taxi transfer takes you to Sant'Agata dei Due Golfi, from where you walk to Colli San Pietro, positioned slightly inland and high above the coastline. Walking amidst the scent of wild flowers and Mediterranean maquia, today's picturesque trek takes you along old country lanes and footpaths. You will pass through terraced fields and olive and lemon groves that open out onto the Mediterranean, before reaching Colli San Pietro where you can take a rest and enjoy the views over the Gulf of Naples. From here you can catch a local bus to Amalfi, where you check in to your hotel for the final three nights of your holiday. You can expect today's nine-and-a-half kilometre walk to take approximately two-and-a-half hours. Toady's walk is also the most famous. Often a highlight of the trip, the Sentiero Degli Dei, or Path of the Gods, is justifiably regarded as one of the greatest coastal trails in the world. The high cliff path offers magnificent views of the Bay of Salerno and Capri. After taking a bus to the start of your walk in Bomerano, the trail passes under huge limestone cliffs and above picturesque stone farmhouses until it reaches the attractive village of Nocelle. From here, you descend down an ancient stairway, past pretty flower gardens, into Positano. A poor fishing village until the 1950s, Positano has grown into a chic town that is still a favourite with Hollywood stars. Spend time enjoying the town and beach before catching the public bus back to Amalfi. You can expect today's 12.5 kilometre walk to take approximately four hours. You have the choice between two walks today. A short, easy loop gives you plenty of time in the afternoon to explore the stunning harbour town of Amalfi. Here, you may choose to look around the impressive Duomo di Sant Andrea (St Andrew's cathedral), with its remarkable baroque interior dating back to the 11th century. The beautifully restored ancient Roman basilica is another highlight. Alternatively, you might choose to relax in one of the many cafes or gelaterias, or look around the curio shops. If it's a hot day, a swim from the public beach might appeal - don't forget to pack your swimming costume and towel. Another option this afternoon is to take the local bus up to Ravello, where you can explore its glorious mix of Moorish flair and aristocratic excess. This tranquil spot, located high on a rocky promontory overlooking azure waters, has attracted artists and writers to its enchanting streets for generations. The longer loop walk will satisfy the demanding walker, with its spectacular views of the Bay of Salerno and the high cliffs of the Amalfi Coast. Depending on which walk you choose, you can expect today's six and 14 kilometre walks to take approximately two and four hours, respectively. You will need one main piece of baggage and a daypack sufficiently large to take everything needed for your walking day, such as your water bottle, snacks, spare clothing and camera. Your main luggage will be transferred to your next accommodation on days 3 and 5. Please clearly mark all your belongings with your name and the name of the next accommodation and have your bags ready and at the reception by 09:00 on the morning of your departure. Local city tax is required to be paid in cash upon check in to the accommodation. The amount varies from 1 to 3 Euros per person per night, with the higher amount relating to higher category hotels. We recommend flights into Naples airport which are served by both budget (including Easyjet) and non-budget airlines (including British Airways) from multiple airports in the UK. For this trip you can fly into and back from Naples airport. From Naples airport you can take a bus directly to Sorrento, see www.curreriviaggi.it/lineecentro_aeroporti.html. Alternatively from Naples central station you can also take the Circumvesuviana train that goes to Sorrento. From Amalfi you can take a local bus to Sorrento to catch the direct curreriviaggi bus to the airport or alternatively take the Circumvesuviana train back to Naples Central station. You can also take a bus to Salerno and from Salerno catch a train to Naples central station and an onward bus to the airport. Italy: Visas are not required by UK, Australian, US, New Zealand, US or Canadian citizens. Other nationalities should consult their local embassy or consular office. On this journey you walk 52 km over 6 days (an average of 9 km per day) with the opportunity for longer walks on several of the days. Your route follows well marked footpaths and mule tracks. Many of the footpaths along the coast involve negotiating stone staircases. On some of the days you will catch the local bus to the start/end of the walk. You'll explore both the Sorrento Peninsula and delightful island of Capri on some of Europe's finest walks including the spectacular 'Path of the Gods' and beguiling Ferriere Valley. You stay in three contrasting locations; the lively cliff-top town of Sorrento, the tranquil hamlet of Marina del Canto and beautiful Amalfi, where colourful houses cling to the rocky cliffs. Enjoy fresh seafood and other local delicacies dining out at a different restaurant each night. Tue 16 Apr 2019 - Fri 26 Apr 2019 Your trip can depart anytime between the above dates. Contact us for triple room requests and solo traveller prices. Sat 27 Apr 2019 - Tue 28 May 2019 Your trip can depart anytime between the above dates. Contact us for triple room requests and solo traveller prices. Wed 29 May 2019 - Thu 25 Jul 2019 Your trip can depart anytime between the above dates. Contact us for triple room requests and solo traveller prices. Fri 26 Jul 2019 - Thu 8 Aug 2019 Your trip can depart anytime between the above dates. Contact us for triple room requests and solo traveller prices. Fri 9 Aug 2019 - Mon 19 Aug 2019 Your trip can depart anytime between the above dates. Contact us for triple room requests and solo traveller prices. Tue 20 Aug 2019 - Tue 3 Sep 2019 Your trip can depart anytime between the above dates. Contact us for triple room requests and solo traveller prices. Wed 4 Sep 2019 - Mon 30 Sep 2019 Your trip can depart anytime between the above dates. Contact us for triple room requests and solo traveller prices. Wed 16 Oct 2019 - Thu 31 Oct 2019 Your trip can depart anytime between the above dates. Contact us for triple room requests and solo traveller prices. Sun 1 Mar 2020 - Sun 12 Apr 2020 Your trip can depart anytime between the above dates. Contact us for triple room requests and solo traveller prices. Mon 13 Apr 2020 - Sat 25 Apr 2020 Your trip can depart anytime between the above dates. Contact us for triple room requests and solo traveller prices. Sun 26 Apr 2020 - Mon 25 May 2020 Your trip can depart anytime between the above dates. Contact us for triple room requests and solo traveller prices. Tue 26 May 2020 - Sat 25 Jul 2020 Your trip can depart anytime between the above dates. Contact us for triple room requests and solo traveller prices. Sun 26 Jul 2020 - Fri 7 Aug 2020 Your trip can depart anytime between the above dates. Contact us for triple room requests and solo traveller prices. Sat 8 Aug 2020 - Mon 24 Aug 2020 Your trip can depart anytime between the above dates. Contact us for triple room requests and solo traveller prices. Thu 1 Oct 2020 - Tue 13 Oct 2020 Your trip can depart anytime between the above dates. Contact us for triple room requests and solo traveller prices. Wed 14 Oct 2020 - Mon 30 Nov 2020 Your trip can depart anytime between the above dates. Contact us for triple room requests and solo traveller prices.